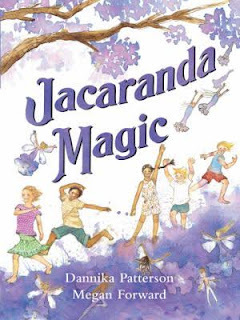 The flowers falling from the jacaranda tree sparks the imagination of five bored friends with nothing to do in this newly released picture book. The story, written in rhyming verse, weaves its way through a multitude of scenarios that the children imagine as they play on and around the jacaranda which is in full bloom. Childhood freedom and fun is presented, reminding readers of all ages of the simple joys of life that can be created just by using your imagination. Award winning illustrator, Megan Forward, has portrayed the story in watercolours that give off a day-dreamy feel - inviting readers into the imaginary worlds that the children make up and explore. This is a great book to read to children to remind them that we have the best time when life is simple, creative, spontaneous and playful – especially when we share those times interacting with family and friends - and often the best times are in the outdoors. It’s also a great book to have on hand if you hear the ‘bored’ word. Brook Tayla writes a picture book review blog at telltalestome@wordpress.com and would love you to drop by, read some reviews, leave a comment and subscribe – you can do that here: https://telltalestome.wordpress.com/contact/ Brook also offers editing services for beginning and emerging writers.